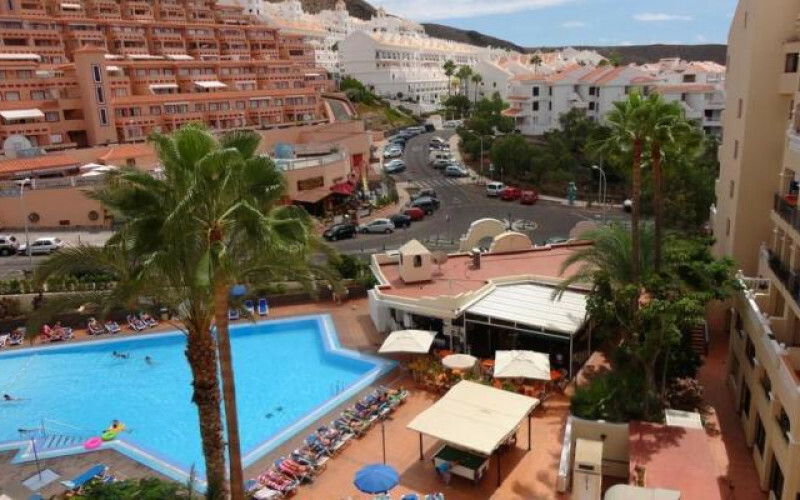 The Castle Harbour Apartments are located in a quiet area of Los Cristianos in an elevated position, but the fun and excitement of the resort centre are within walking distance or guests with walk difficulties can take a short taxi ride. Guests who like to walk can take a stroll along the promenade to reach the main sandy beach and the town centre of Los Cristianos and also its shops, restaurants and lively bars. The seafront walkway can take you to additional resorts such as the lively resort of Playa de las Americas and the beautiful Puerto Colon and Playa Fanabe, where there are an abundance of watersports to try and an endless amount of bars and restaurants to choose from. The air-conditioned lobby area has a 24 hour reception desk offering services such as currency exchange, luggage storage, tourist information and excursion ticket sales for some fantastic day out to see the rest of this beautiful island. The stunning pool is just what you need to cool down after you have been relaxing on one of the many sun loungers that are scattered around the large sun terrace, where areas of shade can be found amongst the trees or there are ample parasols to go around. Some items may incur a charge. There are activities that take place in the pool and there is a section of the pool that allows the children to have a splash around in a safe environment. Next to the pool is the pool bar that plays music and is available to serve refreshing drinks and snacks throughout the day, where guests can enjoy them at the tables and chairs provided on the sun terrace. For something a little bit more energetic, there are tennis courts available, or you can try out the inflatable water park and water sports that are down at the seafront, whilst friends and family can enjoy watching with a nice cold beer, from one of the many beach bars that line the promenade. In the evening you are spoilt for choice with the abundance of restaurants and bars that are open until late, which are close by and also in the resort centre. There is also a supermarket close by for guests who wish to prepare meals at their apartment. The apartments are spacious and bright and decorated in a traditional style. They all have a living area with a sofa bed for two additional people, a double or twin beds, kitchen with a hob and fridge, private bathroom with a bath or shower and a balcony or terrace with views of the pool, or spectacular views across the resort of Los Cristianos. Due to its location, it may not be suitable for guests in wheelchairs abut is offers a peaceful and relaxing holiday that is good value for money.